What is the difference between covalent, ionic, and metallic bonds? Two or more elements are held together by their electrons, but the electrons can do this in different ways. Electrons are like the skin of the atom because they are on the outer parts of the atom. Atoms interact with each other mostly by contact or trading of electrons, just like people interact with each other by contacting skin in the form of a handshake. As you read through the explanations of the different types of bonds have the periodic table of metal versus non-metal elements open. If you are confused by this section then it is suggested you go back to the metals and non-metals section. Covalent: One way to create a bond between elements is if those elements share electrons. The covalent bonds form between two or more NON-METAL elements. These bonds are typically strong and flexible. One good example of covalent bonds is the bonds in your skin. Your skin can be twisted to show its flexibility and it takes a very sharp edge, like a knife, to cut it, which shows its strength. Ionic: Another way to create bond is if those elements steal electrons from each other. The ionic bonds form between at least one METAL and at least one NON-METAL element. These bonds are typically strong and brittle. One good example is salt. You can crush it with a hammer, which shows its strength. When that happens, it will crumble into smaller pieces showing its’ brittle nature. Metallic: The third and least common type of bond forms if the elements create a sea of electrons. This means the electrons become delocalized from their original atom and flow easily from one atom to another. It is like if you were swimming in a lake or ocean. Your sweat delocalizes from your body and mixes in with all the other water around you. The metallic bonds form between two or more METALS. These bonds are typically strong, have moderate flexibility and conduct electricity well. These 3 types of bonds (covalent, ionic, and metallic) make up what are called intramolecular bonds (Notice the first 5 letters: INTRAmolecular bonds). They are the bonds formed within one compound or molecule. With this information we want to be able to identify different compounds that we come across. Any time we see a chemical in front of us we want to be able to label it as covalent, ionic, or metallic. The first stage of this is to be able to take two elements together and say what kind of bond would form between them? Examples are below. 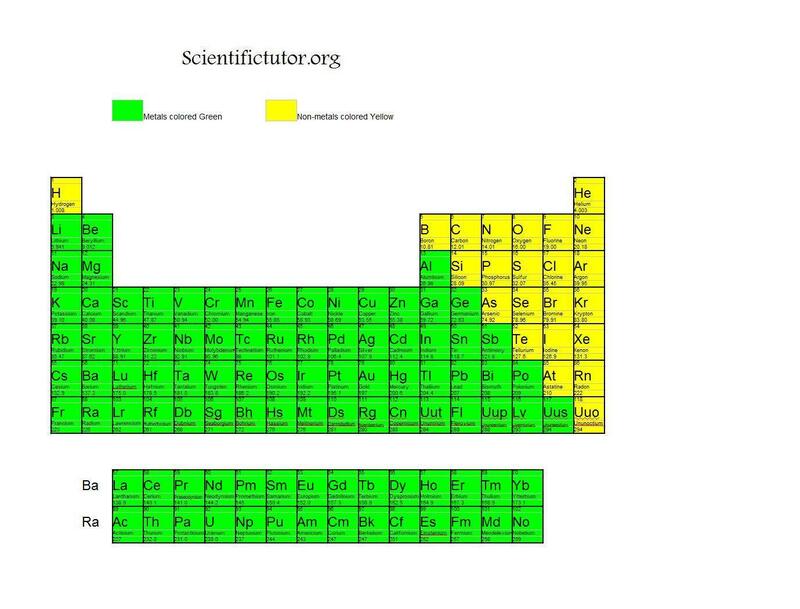 Examples: Label each pair of elements as covalent, ionic, or metallic in terms of the bonds using the metals versus non-metals periodic table. VIDEO Explanation of bonding examples 1. PRACTICE PROBLEMS: Label each pair of elements as covalent, ionic, or metallic in terms of the bonds bonds using the metals versus non-metals periodic table. You also want to be able to look at complete compounds and be able to tell if they are covalent, ionic, or metallic. Examples: Label each compound as covalent, ionic, or metallic in terms of the bonds using the metals versus non-metals periodic table. VIDEO Explanation of bonding examples 2. PRACTICE PROBLEMS: Label each compound as covalent, ionic, or metallic in terms of the bonds using the metals versus non-metals periodic table. How different compounds and molecules form the way they do depends on whether they are covalent, ionic, or metallic. Covalent will be discussed when you get to the valence electron dot structures lesson (Lewis structures lesson) later in the website. Ionic will be discussed in another section of this lesson called how to form ionic compounds. Metallic will more than likely not be discussed on this website.